Congratulations to our 16 brand new graduates of IML MAS & HSCA 2018! The special Guest Speaker was the Logistics Director from Richemont Group, Mr. Armand Villadoniga. An IML Alumni, Mr Villadoniga was one of our 1st edition IML Graduates in 1993. Networking after the Ceremony was enjoyed by all. 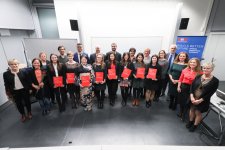 Congratulations to our 16 brand new graduates of IML MAS & HSCA 2018!At the graduation ceremony on December 5th 2018, we had the pleasure to welcome the President of IML, Mr. Philippe Petitpierre, as well as the Director of EPFL-CDM Prof. Dominique Foray The special Guest Speaker was the Logistics Director from Richemont Group, Mr. Armand Villadoniga. An IML Alumni, Mr Villadoniga was one of our 1st edition IML Graduates in 1993.Networking after the Ceremony was enjoyed by all.